Total Score: 8.92 - EDITOR'S CHOICE! Introduction: Megabass was officially established in 1985. It wasn’t until 2003 that I fished my first rod from this company, and already at that time, there were discussions of “the good ole days” with many feeling Megabass had passed its prime. Any time a small builder grows and begins to offer their product on a larger scale, people will gripe. 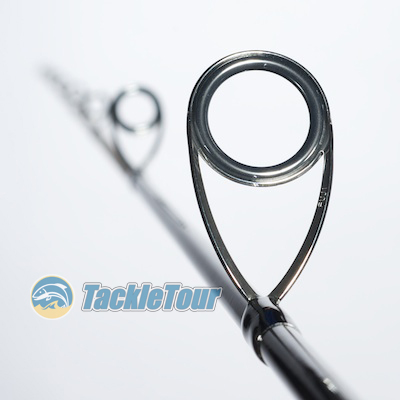 Despite the criticism, Megabass has continued to grow and while there are many other manufacturers in Japan, they, along with Evergreen International, are the top two rod companies that come to mind when anyone on our side of the pond begins a discussion concerning Japanese domestic market (JDM) fishing rods. Of course, with official US distribution channels and a new US consumer friendly warranty, Megabass is not purely “JDM” any longer. Up until recently, even with official US distribution, Megabass was still largely considered a rod made for the Japanese market because all their lengths, tapers, designs, and frankly, prices, catered to their home country. Late in 2010, Megabass set out to change this when they debuted a new line of rods within their Orochi series named, Orochi X4. We offered a preview of this series back in September of 2010, but even at that time, we didn’t really know what to expect. 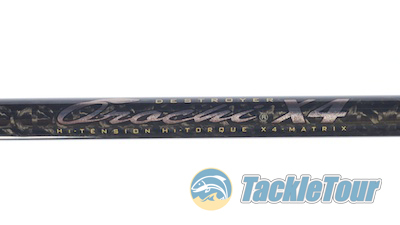 Introducing Megabass's Orochi X4 series of rods. Judging by the specifications and names for the individual models within the X4 line, it seems Megabass decided to take some of their most popular rods across all lines and offer them in this new X4 series. For example, there is an X4 interpretation of the Evoluzion series Elseil, one for the base, Destroyer series Seven Eleven, and one for the Orochi Huge Contact Destruction. In October of 2010 Megabass USA reached out to us for an independent assessment of these sticks. In October of 2010, Megabass USA received their first shipment of these X4 sticks and reached out to us not only to gauge our interest in reviewing a model or two, but really, to get our private assessment as to whether or not these sticks had something to offer against their original counterparts. It seems even Megabass USA was receiving what they felt might be marketing rhetoric from Megabass Japan and they just wanted some reassurance that this new series was worthwhile. Among the sticks they sent? X4 versions of the Aaron Martens Limited (top) and Seven Eleven (bottom). 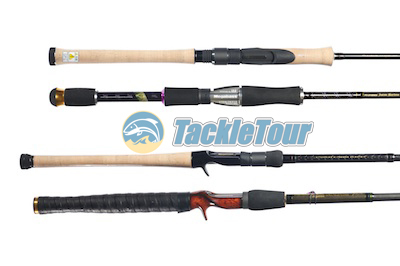 The Lab: Megabass USA sent over the only three models they had in stock for an appointment with our RoD WRACK. These sticks were the F3-610X4S Aaron Martens Limited, the FX-711X4 Seven Eleven, and the F6-72X4 Destruction. Here’s what we found out. 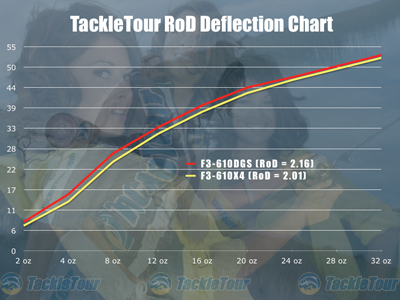 Fig 1: This chart illustrates the deflection characteristics of the new Orochi X4 F3-610X4 (yellow curve) versus the original F3-610DGS. Note that while the shape of both curves are almost identical, the X4 version is just a hair more powerful than the original. F3-610X4S vs F3-610DGS: The original F3-610DGS was a classic the second it debuted back in 2004 within the newly created Orochi Big Contact series of rods. It was BASS Elite Series Pro, Aaron Marten’s weapon of choice and an easy winner of our Editor’s Choice Award back in 2005. The new, Orochi X4 interpretation of this same rod is a hair lighter, and a fraction better balanced, but with a slightly higher balancing torque even with a longer rear handle. The X4 interpretation has the same, soft tip as the F3-610DGS, yet it has a bit more backbone. It is also about $70 less than the original. 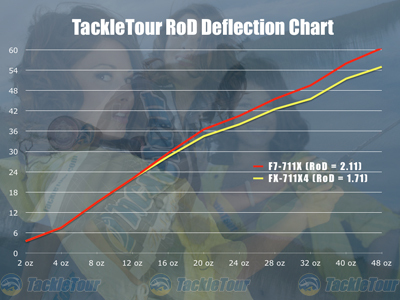 Fig 2: This chart illustrates the deflection characteristics of the new Orochi X4 FX-711X4 (yellow curve) versus the original F7-711X. Note how both curves start out the same suggesting the X4 version has the same tip as the original, but the yellow curve flattens out a little suggesting the X4 version also has a better backbone. FX-711X4 vs F7-711X: The original Seven Eleven was my introduction into the Megabass rod line and our original Enthusiast Rod review back in 2003/4. What I still find unique about this rod is its uncanny accuracy when making overhand and sidearm casts. The X4 version has the same spiral guide configuration, is a full gram lighter, balances out two inches worse than the original, yet has a balancing torque of 0.26 ftlbs vs the original’s 0.31 ftlbs. As you can see in the deflection chart above, while the X4 version of this stick seems to share the same tip as the original, as more load is applied, the FX-711X4 deflects less than the original suggesting it has even more backbone. 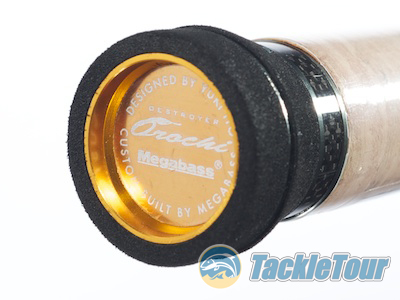 So on those two rods alone, what we discovered overall is with the new Orochi X4 blanks, Megabass is able to produce a rod that is not only more powerful than its original counterpart, but lighter as well! The rods’ balance point and balancing torque numbers are mixed depending on the models involved, but we found an interesting phenomenon in both these analysis. In both comparisons, the rod that balanced out better, had a higher balancing torque! That's completely counter intuitive, but goes to show you that you cannot go by balance point alone. The F3-610XS features the same, eccentric first guide as the original.